Seems like all of the food dates got pulled in a row! There were only maybe 5 dinner dates, tops, and they seem to have all been picked in a row practically! Eddie was very happy with our Jupiter’s date! Though we didn’t play in the game room while there, we did head somewhere else for a game-room date, entry soon-to-come! Eddie was pleased with his selection! If you’re from the Champaign area, odds are that you’ve had a late night meal at Merry Ann’s Diner (I prefer the original location, but that’s just me!). This is one of the classic old-style diners that has greasy spoon written all over it–but in a good way. No, a great way! Merry Ann’s holds special meaning for Eddie and I because it was actually the location of our first meeting! For those that aren’t aware, Eddie and I actually met on myspace. We talked online for a few days, then decided to meet up for coffee at Merry Ann’s. We spent a couple hours just talking and getting to know each other. While we were dating, we spent many middles of the night at Merry Ann’s for a late-night dinner after his 2nd shift job ended. We also went to Merry Ann’s on our wedding night after our reception & our post-reception reception at Esquire. What can I say, there’s nothing like a diner stack in your wedding dress. There’s also nothing like falling asleep propped against the newspaper stand outside Merry Ann’s in a wedding dress… but that’s another story. Speaking of diner stacks… that’s exactly what we indulged in on this date. For those that are unaware, the diner stack is THE food to get at Merry Ann’s. It’s so delicious, though it doesn’t look that appetizing. Trust me though, it is. 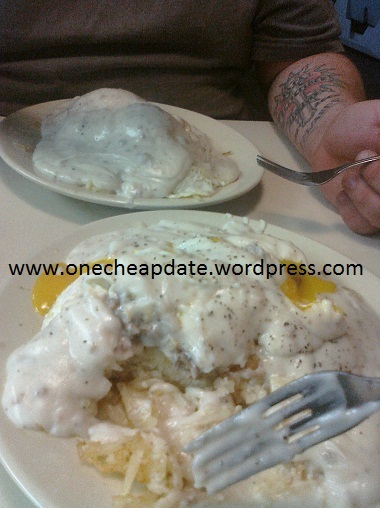 You start with a biscuit, top with hashbrowns, sausage patties, cheese, eggs, and sausage gravy. It's heaven on a plate. Or a heart attack. Fine line. Oh Merry Ann’s, why can’t you be more WW friendly? It’s worth it once in a great while though to save up all my flex points to indulge in one of these bad boys. Yum. 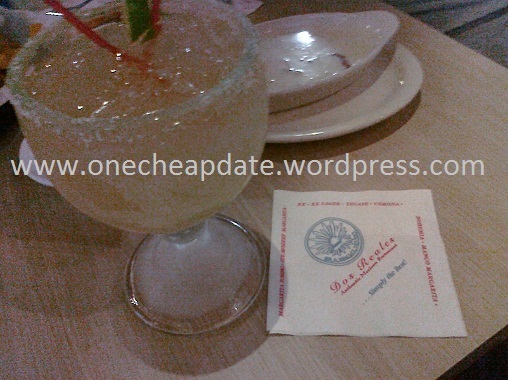 I’m playing catch-up with our dates, so we didn’t necessarily do all these in order, or all at once… but recently Eddie drew from the date jar: Margaritas & Mexican and we headed to our FAVORITE mexican restaurant in Champaign, Dos Reales. 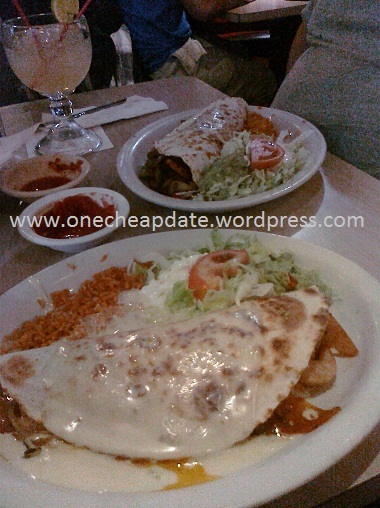 We hadn’t been in a really long time, as we’ve been watching what we eat with Weight Watchers (see my journey at www.tealesmeals.blogspot.com ), but we treated ourselves to Dos, and boy was it worth it! This place always has a full parking lot, and with good reason–it’s delicious! But don’t take my word for it… see for yourself! We started out with margaritas on the rocks, chips & salsa, and some cheesy/bean dip! Yum! My favorite meal of theirs is the fajita quesadilla. Eddie loves this as well… I go with shrimp & he goes with steak. My mouth is watering just thinking about it! 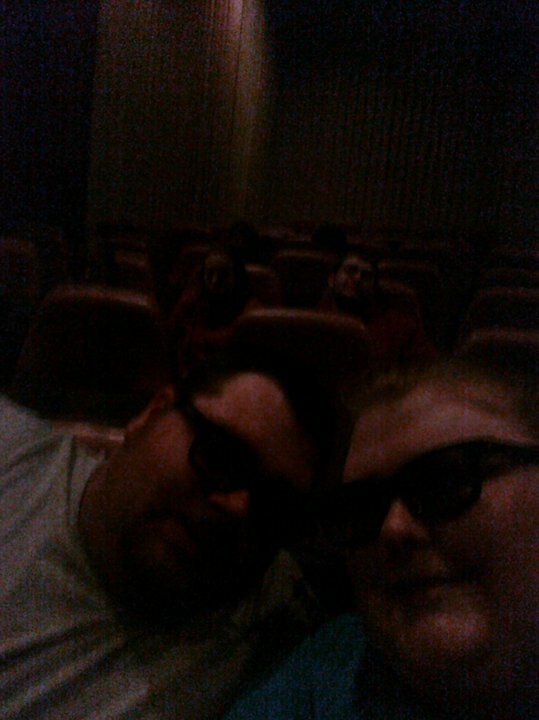 The final installment of our Friday night triple date was to head to the theater to see a movie of Eddie’s choice. He’s been talking about wanting to see The Green Hornet when it came out, though I didn’t have a whole lot of interest in it… however, I’m a good wife who makes sacrifices for date night, so off we went to see the movie, in 3D, no less! Movies in our area aren’t super outrageous, unless you see a 3D movie, then they add $2.50 per ticket! Total cost for our tickets were around $20. We also have a frequent movie-goer card, which earns us rewards every time we purchase tickets, for free concession items! All in all, Eddie enjoyed the movie… and I fell asleep… what can I say, the dark 3D glasses, combined with a boy-movie, did me in! Eddie says our next movie can be a chick flick. Good husband. 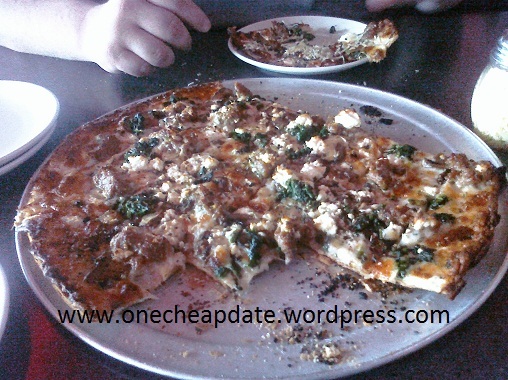 Cheap Date Tip: Look into loyalty programs for businesses & restaurants in your area. If you sign up for rewards cards or email newsletters, you can get some good freebies and discounts! We combined our cupcake date with another date that Eddie drew. 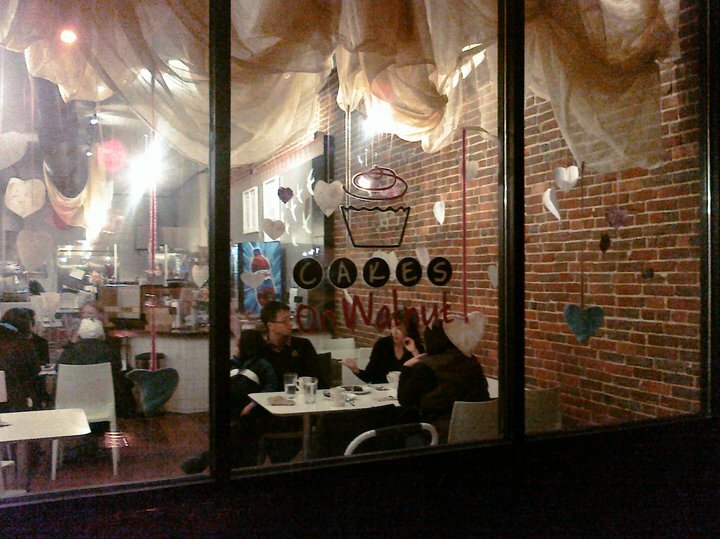 The original plan was to head to Esquire (right next door to Cakes on Walnut!) to play some pool, but on a Friday night, it was pretty busy, and no pool tables were available. This is a place that holds some significance for Eddie and I, as we spent Valentine’s Day 2008 here playing pool & flirting with one another, before we were officially a couple. This was always the watering hole of our choice when we lived in Champaign & also went here after our wedding reception for some beverages & fun with friends. Maybe we’ll try the pool thing on a less busy evening! 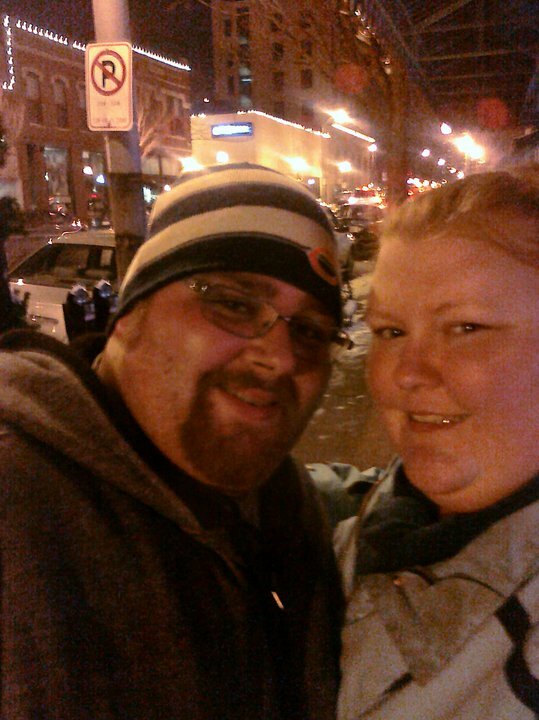 Leaving Esquire to head out to part 3 of our triple date! 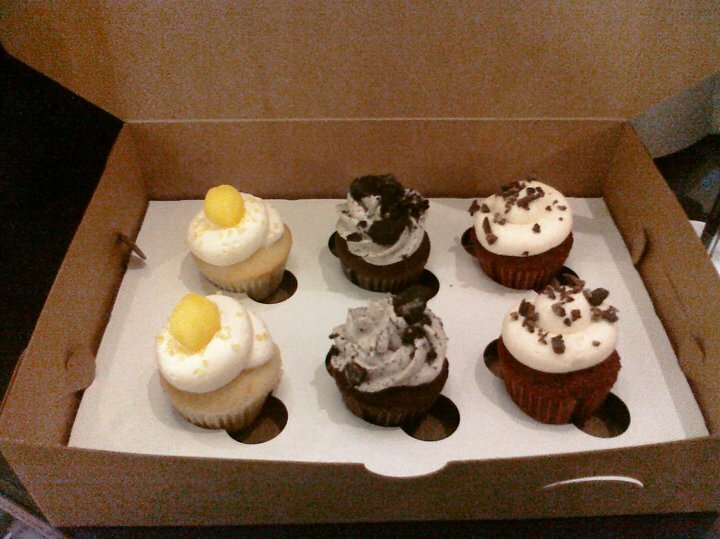 They offer small cupcakes (the ones closest in this picture) and large cupcakes, then they also offer a box option of mini cupcakes. Considering that Eddie and I are doing Weight Watchers (see our progress at www.tealesmeals.blogspot.com ) we opted for a small cupcake each, and went with Cookies n Cream. The atmosphere in here is great. It’s small, but not too small, and it’s always decorated in a unique way, usually for whatever holiday is upcoming (they had very cute Valentine’s decorations up). 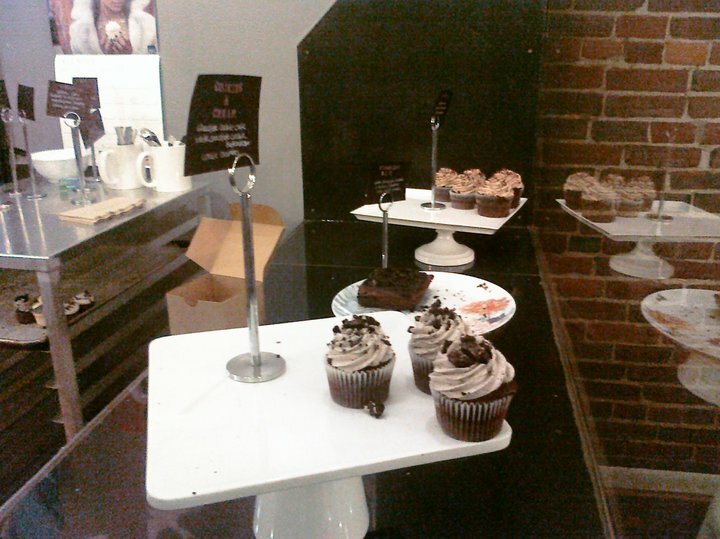 Not only do they have cupcakes, but they also have drinks & ice cream, but we just went for the cupcakes that night. 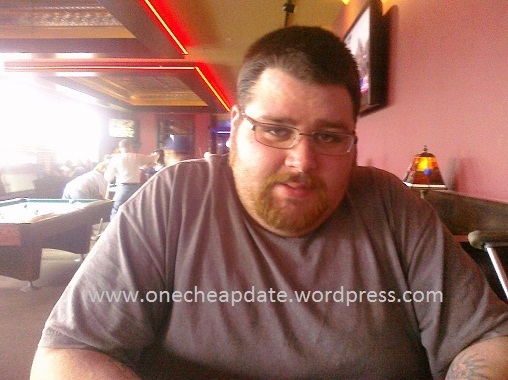 We enjoyed our dessert and conversation for a mere $5.38! 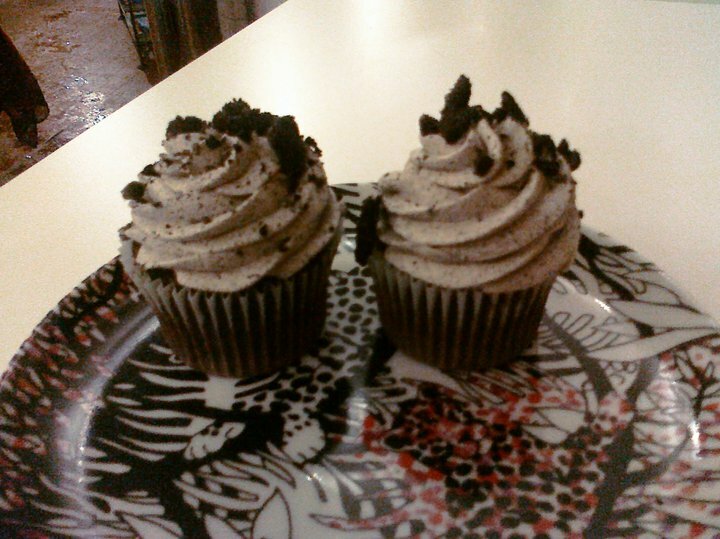 Because it doesn’t take long to consume a small cupcake, we paired this date with another in the area… check out Date 19 for the details on that one! Our 17th date was a freebie: Head to the Humane Society to visit the animals! 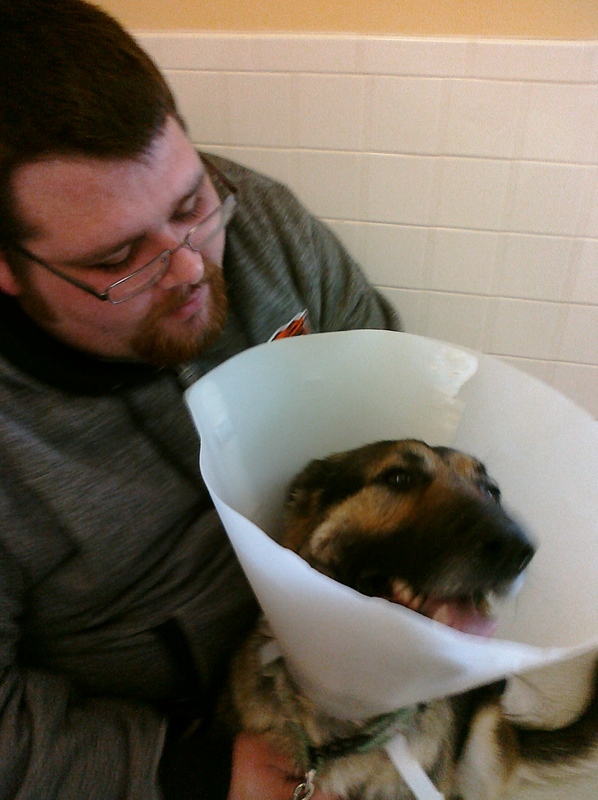 Visiting the Champaign County Humane Society in Urbana, IL is something that Eddie and I have enjoyed doing for as long as I can remember, but it’s still something special to do, so was a fun date. It’s free, as long as you don’t find any new little friends to take home… which Eddie almost did this time! As we were walking in, we saw a volunteer walking a dog… a German Shepherd, to be exact. Eddie loves them, and our dog, Dora, is half Shepherd. This dog that was being walked was much bigger than Dora, however, at about 90 pounds! He was a handsome dog though & Eddie wanted to play with him for a little while. Kobi was a very friendly dog. He knew how to sit and shake and was eager to please! 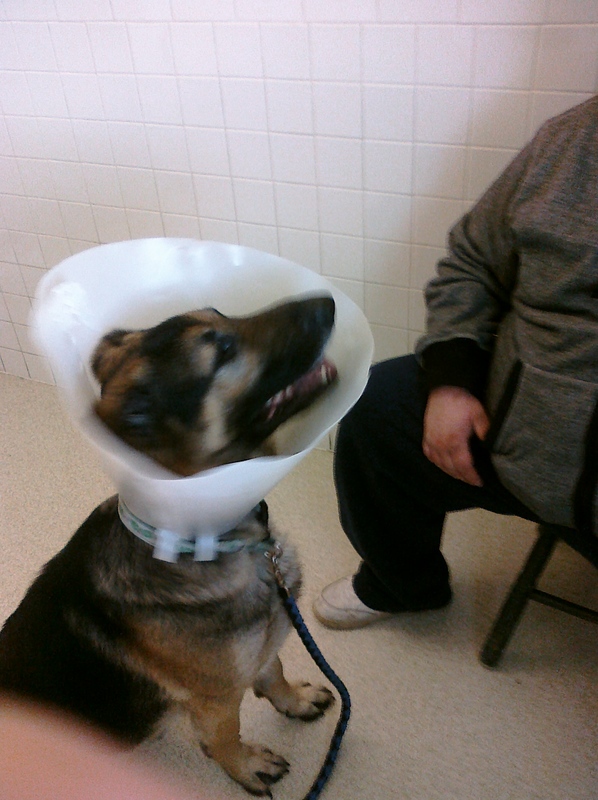 As you can see, he had recently undergone a little surgery, so had the “cone of shame” on! Eddie went to talk to the staff to find out more about him, in hopes that I would fall in love with him too, I think. But, one must be rational, and two dogs and three cats is just far too many legs in our household at one time! I’m sure Kobi has found a great home though, with lots of room for him to play! Going to the humane society is always a fun place, even if you aren’t looking for an animal to take home. There are so many animals, some of which may have been there for months, and to be able to give them a little one on one attention and make them feel loved for a few minutes makes me feel really good! Every animal I’ve owned as an adult has come from a shelter, and I encourage others to look for a four-legged friend there too! Cheap Date Tip: Volunteering your time to help others can be a “date” too! Spending quality time with your loved one is really all that you need to classify something as a date, so spend it doing some good! We choose to socialize animals, but the options are endless in your community! Our assignment for date 16 was to head to the thrift store and explore, then find something fun to entertain ourselves with. This one was a challenge, because we decided to do it on New Year’s Day, which meant that The Salvation Army thrift store was closed (and they always have good finds between their two locations!). We headed to Goodwill though and were happy to find them open! 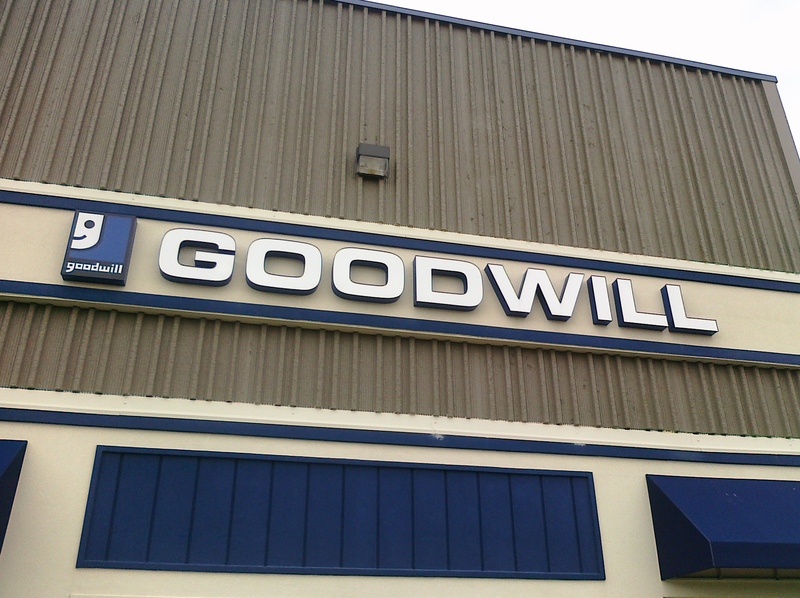 Our Goodwill used to be kinda ghetto but they recently moved locations and this new one is really really nice! We browsed for a little while and then headed to the puzzle and game section, which was really large! 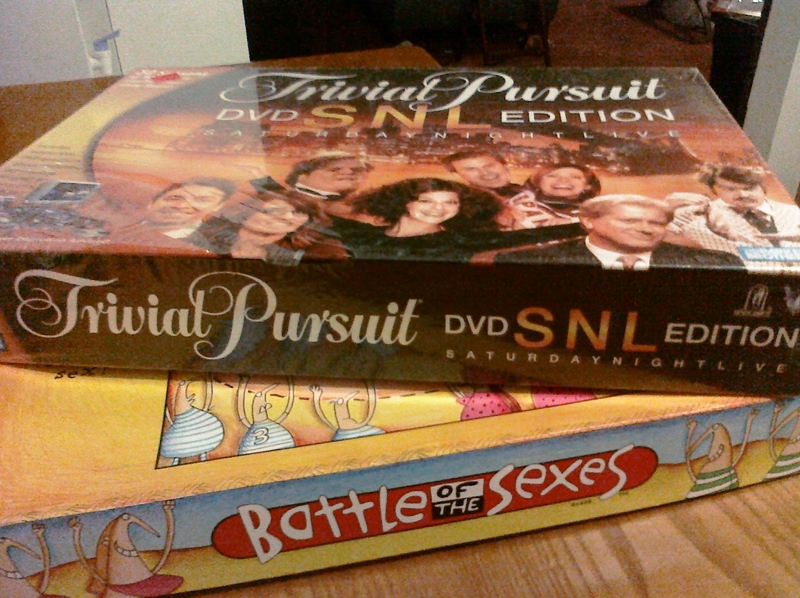 We ended up finding Battle of the Sexes that was just like new, as well as Trivial Pursuit, the SNL edition w/DVD questions that was still in the original shrink wrap packaging! They each had a price tag of $2.96, so we figured we’d get each of those–$6 for a couple games to play at home seemed really reasonable! So imagine our surprise when we went to check out and all toys & games were 50% off! We got both games for a grand total of $3.22! Playing battle of the sexes was extremely funny because Eddie’s answers for some of the female questions were hysterical… so much that I was in tears with laughter! But as it turns out, we were not the experts on SNL that we thought we were… that game was hard! It’s still a really great find for only $1.50 though! These games gave us several hours of entertainment, and at a price that definately makes for a cheap date! Cheap Date Tip: Thrift stores can be an amazing source for all kinds of things, date night-related or not! Even just spending a couple hours browsing them with your date can count as quality time well-spent… who knows what kind of treasures you might find! Another date that we celebrated this weekend was Fondue Night! We decided to do this on New Year’s Eve and it turned out really well! We don’t own a fondue pot, so we looked for an easy cheese fondue recipe that we could cook on the stove top and one that also wouldn’t require a number of speciality cheeses that we were unfamiliar with. After some googling I finally found one that sounded pretty good & we decided we’d give that a try. We also wanted to do a chocolate fondue as well, so we set out to the grocery store to get all necessary supplies. Cook & crumble bacon, then set aside. Brown onions in 1 tbsp bacon drippings, then coat with flour and add remaining ingredients. Cook on medium heat, stirring constantly, until mixture becomes liquid (this may take a little while, but hang in there, because it does eventually happen! You can turn the heat up a little if necessary, just stir constantly so it doesn’t stick or scorch). Once it’s smooth & creamy, add bacon & serve. We decided to go to Panera to grab a few bagels to cut up and have with our cheese fondue–Asiago Cheese, Jalapeno Cheddar, Everything, and Plain bagels went with this deliciously! 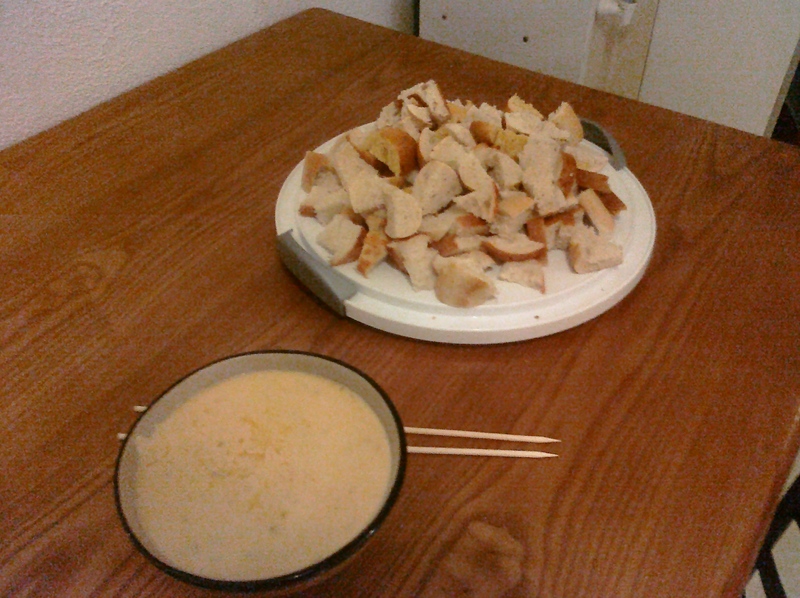 Bread & cheese for New Year's Eve! That filled us up for a long while, so we waited to have our dessert fondue until later in the evening. For the dessert fondue, we just got milk chocolate chips and melted them in our double boiler before transferring to a bowl. To dip, we got a mini strawberry cheesecake and a variety of fruit. It was SO good! 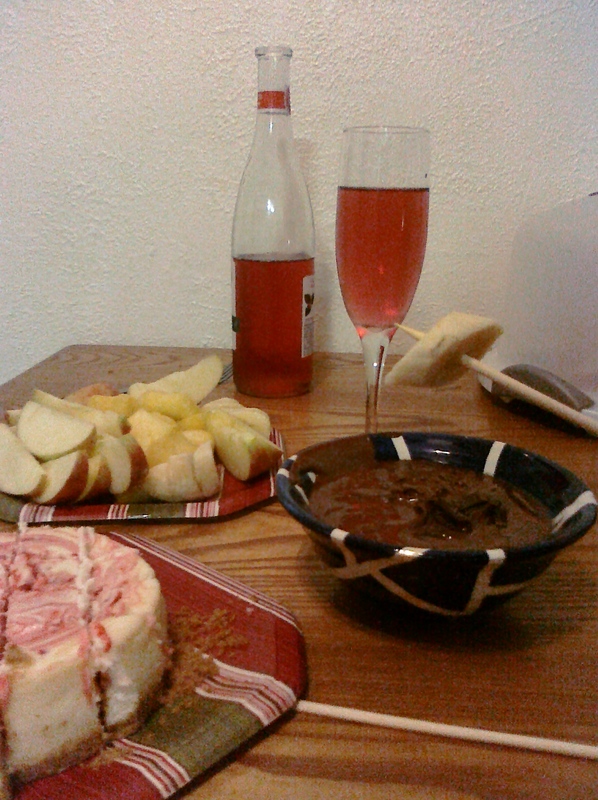 Enjoying our fondue with some dessert wine! 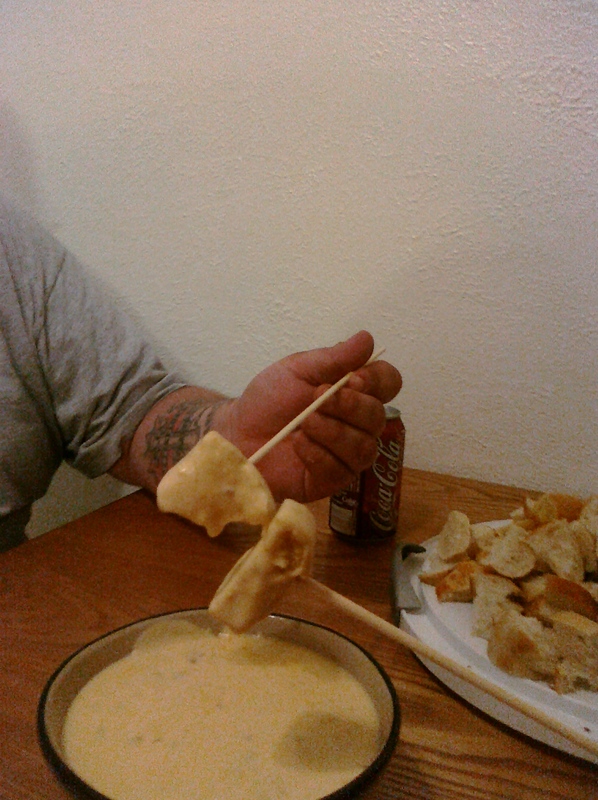 Fondue night was definately fun! It would be easier in the future with fondue pots (I have my eye on an electric set from Target, just sayin…) but we made do pretty well with what we had! Might have to make this one a NYE tradition! 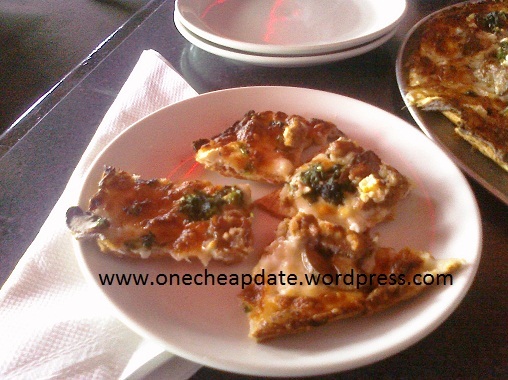 Cheap Date Tip: Date night doesn’t have to mean that you go out and do something! Stay in and do something special and outside the norm for a regular night in! 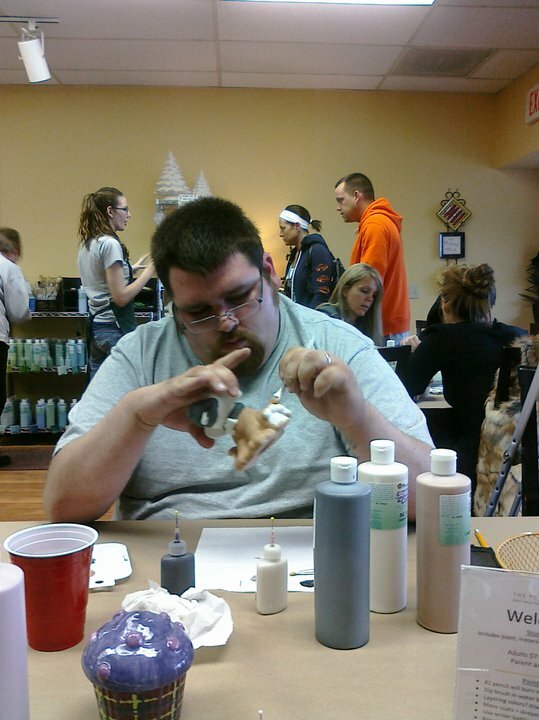 On Friday, Eddie and I went on another of our dates, this time to a paint your own pottery studio. 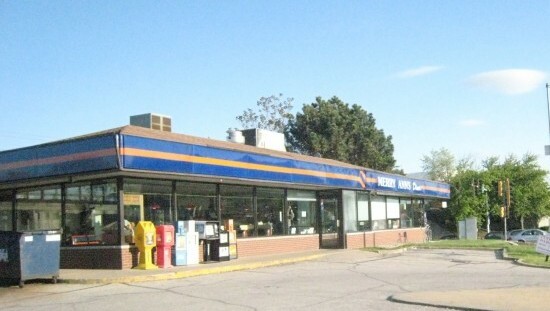 I used to frequent one of these all the time in Bloomington when I was in college and enjoyed it so much, but I haven’t been in years. 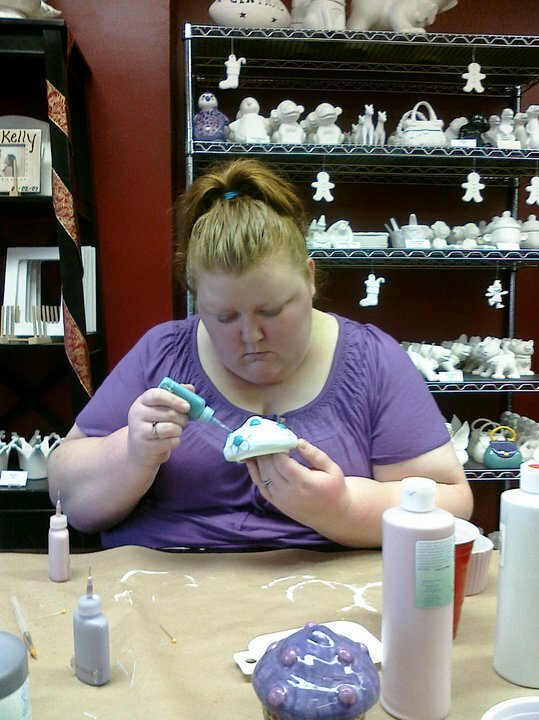 There is one in Champaign, called The Pottery Place, but we’d never been to it. In fact, I kind of doubted Eddie would be very interested in doing something like that, but he was pretty open to the idea when he drew this date, so that was exciting for me! We headed there and there was only one other group painting. 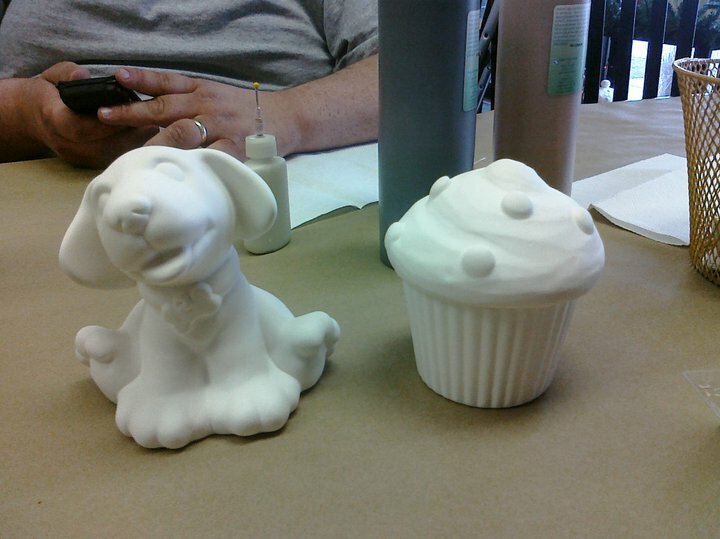 We picked our pieces–Eddie chose a ceramic dog that resembled our dog, and I chose a cupcake box. It was nice and quiet and peaceful for painting! However, apparently everyone in town with small children was just waiting for Eddie and I to arrive before they got there, because in the span of about 20 minutes, about a dozen children under 5 arrived with their families. It was a mad house. And our peace and quiet was no longer. Despite the lack of concentration, we powered through and spent about 2 1/2 hours planning our designs and painting. Despite the crazy children, the experience of painting our pottery was pretty enjoyable for both of us–even Eddie loved it! For those that have never been to a place like this, how it works is that you go in & browse their selection of pottery for purchase. They have pieces from about $10 and up. You can paint as many as you want to purchase, then you also pay a small studio fee to use all of their supplies. The studio fee at The Pottery Place is $7, and that includes the clear glaze that they put on your pottery after you paint it, as well as the firing of your piece. When you’re done with your piece, you leave it there, and in about 4 days you pick up your finished product! 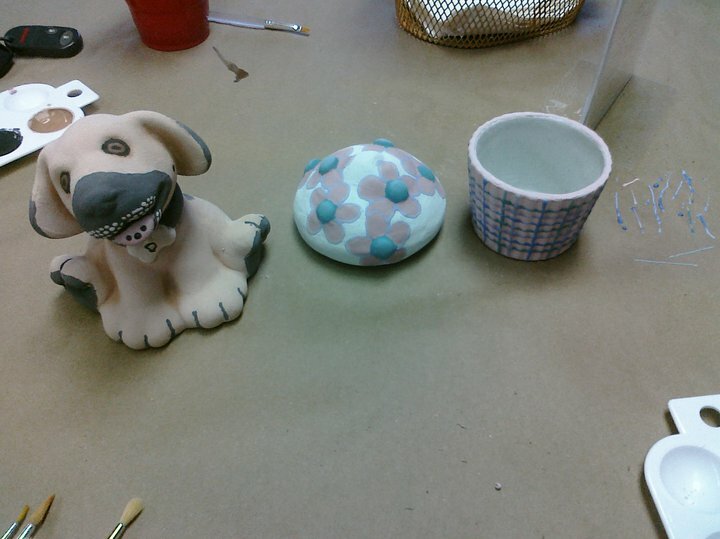 These are what our pieces looked like before firing them! Our pieces won’t be available for pickup until Tuesday, but I’ll add a picture of our completely finished products then. The cost breakdown was $10 for my piece, $10 for Eddie’s piece, and then $14 total for our studio fees. With tax, it was $35 and some change. This would definately be something we’d do again in the future. As I mentioned before, you pay a studio fee to use their materials, but if you wanted to purchase 2 or 3 pieces to paint in one sitting, you could do that, then only pay 1 studio fee. That’s something I used to do was spend a whole day at the studio painting pottery… it’s so relaxing–well, as long as there’s no screaming children involved.